(Reuters) - South Carolina's capital on Tuesday could become the first U.S. city to ban the use of bump stocks, a gun accessory that has drawn national scrutiny after being found among the Las Vegas mass shooter's arsenal of weapons in the October rampage. 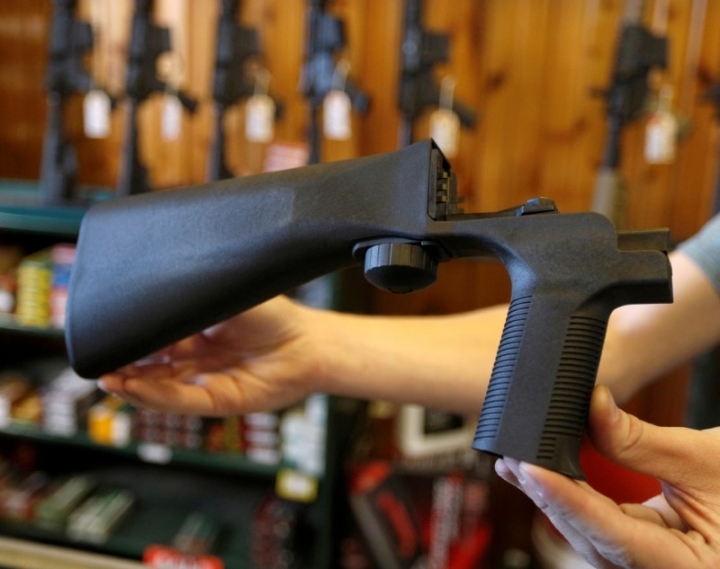 Last month, Massachusetts became the first state to pass a law that explicitly bans bump stocks. Steve Benjamin, the mayor of Columbia, the South Carolina capital, said the city council was expected in a vote on Tuesday night to approve an ordinance barring the devices, which allow semiautomatic rifles to fire hundreds of rounds a minute like fully automatic machine guns. "One of the common refrains that you hear, whether it was in Texas or Vegas or Sandy Hook, is that a good guy with a gun could have stopped the carnage," Benjamin, a Democrat, said in a phone interview on Monday. "It's time for the good guys with guns to begin to pass some really good policy." Authorities said Las Vegas shooter Stephen Paddock had 12 rifles outfitted with bump stocks in the hotel room where he launched his attack on an outdoor concert, killing 58 people and wounding hundreds in the deadliest mass shooting in modern U.S. history. Since then several states and cities have proposed measures outlawing or restricting the attachments, and the U.S. Justice Department said earlier this month it was considering a ban on certain bump stocks. California and New York do not prohibit bump stocks outright, but the devices fall under the definition of an automatic weapon, which are illegal in those states, according to Anne Teigen, who covers firearm legislation for the National Conference of State Legislatures. Some other states and the District of Columbia have assault weapons bans that could include bump stocks. "We are not aware of any cities that have passed ordinancesbanning bump stocks," said Tom Martin, a spokesman for the National League of Cities. In Columbia, four of the council's six members approved the city's proposed ordinance on a first reading earlier this month. The measure also would ban the use of other gun attachments that allow rifles to fire faster. Owners would be required to keep them stored separately from any weapon. Trigger-enhancing devices are not gun parts, gun components, weapons or ammunition, which state law prohibits cities from regulating, Benjamin said. The mayor, who has a background in law enforcement and said he owns guns, said the measure had drawn support from local police and council members who support the Second Amendment to the U.S. Constitution protecting gun ownership rights. In the busy city of New York, News On Express fills you in with all the breaking world news, in short, and brief news articles so that you can read them on-the-go. Copyright © 2015 - 2019 News On Express. All Rights Reserved.